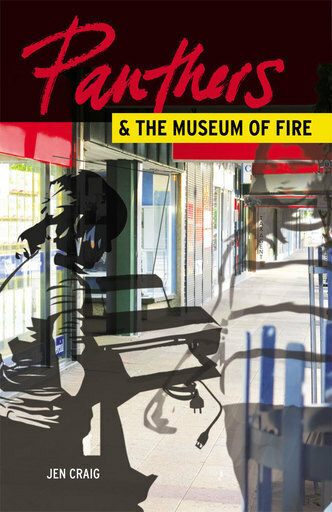 Panthers and the Museum of Fire is a novella about walking, memory and writing. The narrator walks from Glebe to a central Sydney café to return a manuscript by a recently-dead writer. While she walks, the reader enters the narrator’s entire world: life with family and neighbours, narrow misses with cars, her singular friendships, dinner conversations and work. We learn of her adolescent desire for maturity and acceptance through a brush with religion, her anorexia, the exercise of that power when she was powerless in every other aspect of her life. For a long time I have dreamed of such a breakthrough, I thought as I set off from my flat in Glebe on that Monday morning – walking to a café in Crown Street for no other reason than to meet the sister, Pamela, so that I could give her back the manuscript Panthers and the Museum of Fire supposedly unread, as she had insisted on the phone only two days after she’d given it to me. I have spent years and years of my life doing little more than work towards this very breakthrough. I have sacrificed love, holidays, sanity, my health, I told myself on my way up the street from the place where the building I lived in had mired itself in the roots of Moreton Bay figs and playground urine and the foetid remnants of plastic bags – doing nothing but work and work, or at least all the time just seeming to work and work, to get close to this breakthrough that might, indeed, have always escaped me because this is how I find it, and in spite of myself. It’s strange, still, that I should date this breakthrough that I can now call a breakthrough from this Saturday morning only, I was thinking as I left my street behind, glad to have the hour and a half ahead of me even though I knew I wouldn’t need the whole of that time to walk there. I’d stayed up all the previous night reading the manuscript – the very manuscript I had promised Pamela on the phone I wouldn’t read once she had asked me not to read it, and in fact had never had any intention of reading – a detail she should have known if she’d had an ounce of sensitivity but obviously hadn’t wanted to know. I finished it at half past two in the morning and then started it again. I was in a daze, nothing short of euphoria during those long, sweet hours from late on Friday to the Saturday morning, when it all became clear. At first I had been relieved to find that the manuscript was nothing – even now it seems to be nothing – and yet as I read it my mind was bated; the idea of a mind being bated in the way that breath can be bated entranced me as I walked along the narrowing part of Victoria Road where the cars, parked tight by the kerb, even crammed to the corners, made me think that everyone had been affected as I’d been affected and that no one had slept. Although Sarah had called her manuscript Panthers and the Museum of Fire – or at least had written this title on the front of the manuscript, writing it in her handwriting, if in fact it was her handwriting and not someone else’s – it has been so long since I can recall ever seeing her handwriting – the manuscript seemed to have nothing to do with this title: all the suggestive allure that I might have expected from a title like that. I recognised the wording at once when Pamela gave me the manuscript at Sarah’s wake, passing it on to me despite my best attempts not to take it. Anyone would have recognised the wording, anyone who has ever driven along the east-west motorway of Sydney. It was the wording of a sign, of course. The title was a sign – an ordinary sign – a large white-on-brown sign that sits on the side of a road, of the sort that denotes trails or destinations of supposed tourist or heritage interest, in this case for the drivers of cars or trucks that might want to turn off the motorway to go to the rugby league club Panthers, named, as I’ve learned by Googling, not after the mysterious animal that is said to be wandering the Blue Mountains, confounding all attempts to capture it or even to prove it exists, but because a woman called Deidre won a competition to name the club in 1964: the name Panthers being only one of her many suggestions, her many animal-name suggestions. The sign on the motorway directs you to Panthers, where you can play the pokies, eat, buy caps or T-shirts or banded scarves in the Panthers’ colours and so be able to imagine that you are running out on the field in front of a crowd, an obvious faithful of the Panthers rugby league team, or a Panther yourself, a colossus in shorts that embodies the hopes and dreams of thousands – driving to the massive, gleaming building that is the club today, or to the Museum of Fire, where you can buy caps or T-shirts (again) and so imagine you are speeding through lights and overtaking the police in search of a fire that is flaming in secret, fearsome lines of fire that everyone wants put out and yet everyone, too, would prefer to watch as they burn and burn forever – this sign that for years I have known to be nothing more than a sign on a road, and even followed once, in a moment of willed spontaneity and determined flair. – a moment that might have changed my life. The fact that this sign was the title of the manuscript I had been given had affected me from the start in the way that this sign on the road has always affected me. Take the route number fourteen, the sign tells us, and you will get to these places, these ordinary yet wide, bright places that I know to be there, or instead, as I might once have wanted, you will drive out of this existence into a tunnel of darkness, where every possibility ripens in the night. I might make light of the white-on-brown sign that I’ve seen for myself on any number of occasions; I might make light of this sign, in thoughts such as these – I might even make light of the contrast between the suggestive, alluring wording of the sign that I have always remarked on when I’ve driven past it, and the ordinary, merchandised places that it refers to – entertaining my good friend Raf, as I am always trying to entertain him, with thoughts such as these, saving them up for the times I see him – and yet I know that to say this is all I think of this sign (and the manuscript) would not be the truth. Perhaps, quite apart from anything else, it could have been that the reference to this sign and the wording of the sign – the entire coincidence of this sign and the manuscript and the death of the author of it – the one-time friend from my years at high school – had moved my mind into a state of euphoria as I read the manuscript once and then twice within hours of the call from the sister, Pamela, in which case, she would have been interested to know this, I told myself as I walked towards her and the café where she’d arranged for us to meet that Monday. At the wake, she would have loved to hear such a thing – at the time when she still wanted me to read the manuscript, when she had imposed on me this reading of the manuscript, when she wanted, as she no longer evidently does, to believe that something special could come from her sister – but even then I knew that I had to be careful what I said to her. Over the years, I have learned to be careful and this is an instinctive reaction – almost a physiological reaction. There is a certain sort of person that it might be said I have a definite allergy to, as I explained to Raf when he came over for dinner last night. Already once in my life I have allowed myself to be far too free with the expression of my thoughts near Pamela and people like Pamela, I mused as I pulled a sharp-edged, waxy leaf from one of the hedges I was walking past – one of those tasteful, box-shaped hedges that Glebe is full of – a leaf whose webbed underside reminded me of the peculiar setting of the house party that I had described to Raf the day before, and so the physiological and psychological sensations of my one-time religious conversion. But I have to realise that the euphoria I remember after reading the manuscript – the whole time sitting in the chair with the arms that I keep near the window for the purpose of reading – that this euphoria was experienced more as a relief than excitement or in any way a breakthrough in the sense that I am thinking of it now. It was more a large, relieved sigh, a sound travelling out of me, as if the air that had stayed in my mind through those first and second readings had been released in one go, and as such the euphoria itself was not so much a dazed excitement, as I am reinventing it now, but a release of air, of anxiety, of the preparedness that I had brought to the manuscript that supposedly I had to read at one time – my preparedness for something undefined but threatening, very evidently threatening to my self. It was extraordinary that I should have felt so relieved, I was thinking as I crossed to the sunnier side of Allen Street only seconds before a van swung in silence around the corner behind me, nearly pushing me into the stationary cars – a large white van whose blinking flicker continued too fast and for far too long, stunned for the moment, to watch this van that kept on moving in its massive, rattling, unnerving absence of sound. Yes, I began to think again, forcing myself to return to my earlier reflections, so as not to be diverted from what I was trying now to understand as I walked towards Pamela and the café in Crown Street – given how I had been feeling about the manuscript and the circumstances surrounding the passing on to me of the manuscript at the wake – and about the one-time, now deceased friend who had written it, to whom I had hardly spoken in years, as I explained to Raf last night, and whom I could still not tally with the coffin – the contents of the coffin – that disappeared while we were all being distracted by a song that went, as I told him: Nothing compares to you (he might even remember this song, it was years and years old but very popular at the time) – it was strange that it should have been relief that I experienced after reading the manuscript, considering that it was only my old friend Sarah who had written it – a relief that was euphoria, a euphoric relief. You have to imagine a book, I should have told my friend – a book but not a book – the fact that it was a manuscript made a difference. The whole time that you were reading this manuscript that was not yet a book, you would have found the experience of reading just an experience of waiting; the whole time that you were reading, you were also waiting. As soon as you started the manuscript, you would find yourself waiting for it to start, to really start. You kept flicking pages and reading and flicking – not skipping any pages, but flicking them all the same – and the whole time you were reading you were waiting for the story in the manuscript to start for real. This feeling, you have to realise, kept up the whole time. There was a never a moment when you thought you had started on the section of the manuscript where the real part began. At first you would have been flicking the pages and thinking, well she could have cut these paragraphs and all of these pages here, cut all of it so far, and yet this feeling of needing to cut most of what you were reading persisted until the end. In fact the whole of the reading seemed to be just the prelude to a reading; it pulled you along from one sentence to the next, one paragraph to the next, and you held on for some reason, never doubting for an instant that the real part of the story would be about to begin; and even when you knew, later on, when it was evidently too late, that there was no real part – when you watched yourself holding on to your role in the reading like an idiotic fool, holding on for the real part to begin when all the time there was never a real part, all the time there was nothing but the reading of the manuscript one word after another, the words being everything, the storyline nothing – you continued to read, I should have told Raf last night, although I was still jet lagged, if I could call it that, from the experience of reading and writing. It was the most idiotic thing, but you continued to read. I rang Raf when, having put down the manuscript for the third or fourth time yesterday and written for hours like the day before – that is to say, not quite straight after my breakthrough, which had occurred on Saturday – writing for hours again, as I had done through the night, and not being sure any more of what I was doing, or why I was doing it, and needing to do something then – anything at all – to walk out from my flat, from the manuscript and my writing – to shop, I was remembering now – I knew I needed an excuse to shop so I might escape for a moment from all that reading and writing. I rang my friend Raf because I had to do something, my restlessness having become impossible now (impossible to sleep, impossible to think), to invite him over at the last minute, telling myself as I pressed in the numbers (my fingers not so much numb but failing to feel), that this is what we always do; our ringing of each other at the last minute has become a habit over the years, even an assertion of our difference from everybody else – our particular source of pride – that we never plan our rendezvous more than twenty-four hours in advance (when in fact, we have often given days, even weeks of notice, I was realising as I emerged from the backstreets onto Glebe Point Road and crossed to the pharmacy, to its tall panes of glass that held me along with the stripes on the road for a moment and then, as the shade cut the sun, seemed to swallow me whole). Other people need schedules and plan their social life weeks and weeks in advance, I had told myself as I listened to the ringing of his phone in my phone as I waited in my flat, but we are still spontaneous, as we have said to each other on many occasions. So much of life is drained of spontaneity. The older people get, the tighter they get, their skin becomes loose but their minds just tighten like drums. We have always refused to tighten – we continue to stay loose and spontaneous. Others can start getting out their phones, their laptops, and send themselves messages about dinners and arrangements that hem them all around, but we have always stopped at such idiocy. All these years we have preferred to grab occasions on the fly – whole evenings, whole days, without thinking of the cost. It’s what keeps us young and flexible in our minds. Everyone thinks that both of us are younger than we are and this is the reason. We have always refused to grow rigid and tight. Other people succumb but we resist. If we tried blocking in our arrangements in advance we would never get to see each other, I had been thinking while I waited on the phone, still high, as I might have called it, from all that reading and writing and, more importantly, from the enormity of my breakthrough, and wanting now to talk to Raf or to anyone who would listen. I wanted to go out and get walking, and so going out to shop for a dinner with Raf was the perfect way to do it. You should come as early as you feel like, I had said to him on the phone, when he had at last picked up with his usual terse, always ironic and tentative hello – five-thirty, six: whatever. It’s your call. I’m up to my neck in stuff, I said, so I won’t be so prepared, but you are used to my mess after all. I will try to get back from the shops as early as I can. I’ve laid down a sparkling, and a couple of Coopers. It’s been ages since we last caught up – so much has happened, and all of it strange.